the ELEGANCE range at international trade fair. Derprosa logo Derprosa has announced that it will take advantage of the exceptional shop window which the Luxe Pack Monaco exhibition offers to showcase its ELEGANCE range of films. The show will run from the 23rd to the 25th of October at the Grimaldi Forum, and is considered the most important for suppliers of materials and services for high-end creative packaging. On the Derprosa stand (E2), the latest from its ELEGANCE range of films will be on display, including its new film Elegance Gold, a film with a gold colour, and the Silver Matt film with its metallic matt finish. 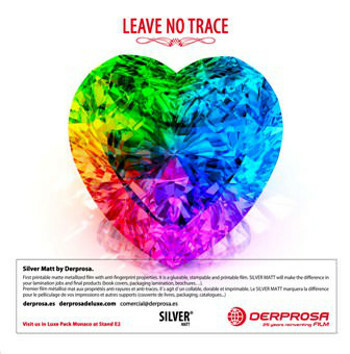 Furthermore, those attending will have the chance to see Derprosa’s other films, such as its Metallized range and its SoFT TOUcH films, which offer a soft, velvety feel. Derprosa said it will offer a surprise at Luxe Pack Monaco with a visit related to its SoFT TOUcH films which it added would turn out to be memorable for those present. In the exclusive surroundings of Luxe Pack Monaco, the company intends to demonstrate the added value that its films offer to lamination, offering solutions which it believes are unique in the market. Derprosa highlighted the fact that this difference is marked by the fact that its films offer an excellent base for printing and provide not only surprising finishes, but significant protection to the packaging of luxury products. Derprosa’s participation at this year’s Luxe Pack Monaco is designed to reinforce its commitment to high-end cosmetics, perfumery, technology, gourmet food and jewellery, at an international level.